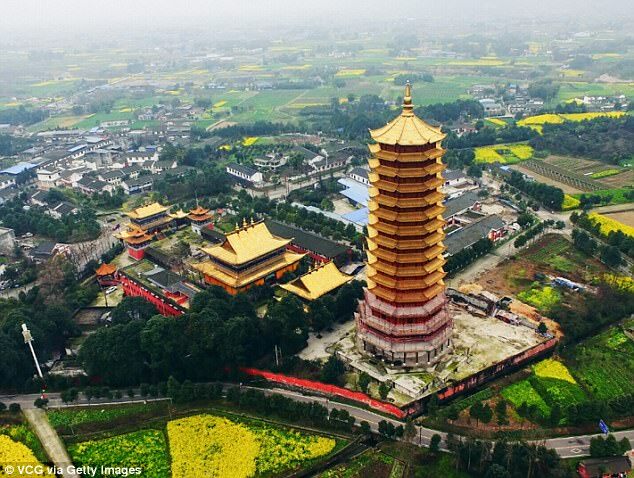 The temple dates back to the Ming dynasty and the pagoda stood 16 stories high and was called one of the tallest in the world. Do you have a picture of the pagoda before the fire? So this was the 16 story Lingguan Tower, in the Nine Dragons Monastery (Jiulong Monastery), in Mianzhu, Deyang Prefecture, Sichuan. It looks like this is just over the old Tibetan-Chinese border on the Chinese side. This was one of two pre-blaze pictures in the links. Curiously it is the only picture to easily come up.